Bring some magic to your holiday season with these beautiful beaded Christmas snowflake ornaments. This snowflake craft is for making beaded snowflake ornaments to adorn your Christmas tree. A simple DIY wire bead snowflake ornament craft that both children and adults can enjoy. Learn how to make beaded snowflake ornaments with our step by step video tutorial! Add a touch of magic to your Christmas tree with a few sparkling beaded snowflakes! When I was a child beading and jewelry making was one of my favorite hobbies. A hobby I get to share with my daughter today. 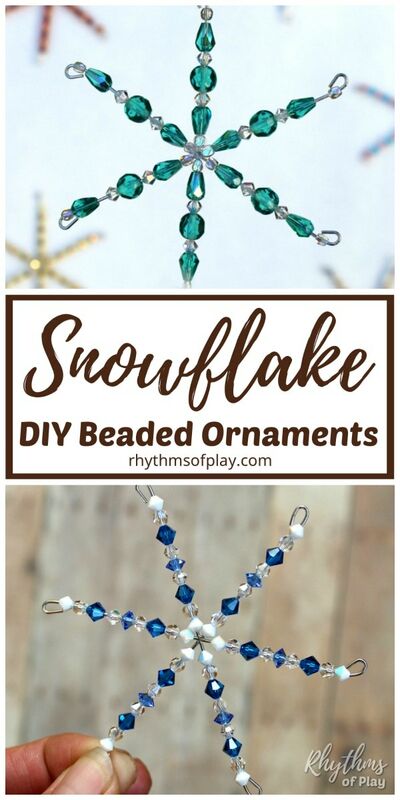 Learning how to make beaded snowflake ornaments is an easy Christmas craft for kids, teens, and adults. All you need is a few snowflake craft supplies! Wire snowflake forms – Click the link to see all of the sizes available. We used a 3 3/4 inch wire snowflake form. Swarovski crystals beads make the most amazing beaded snowflake crafts. Faceted (cut) glass beads can also be used for wire bead snowflake ornaments. Click on the links to see all of the snowflake ornament craft bead options available. Leftover beads can be used to make beaded necklaces and bracelets! Click on the link to learn how! Learn how to make beaded snowflake ornaments with the step by step directions below. Both children and adults can enjoy this snowflake craft. You can see how to complete each step in the handmade beaded snowflake video tutorial in the next section. 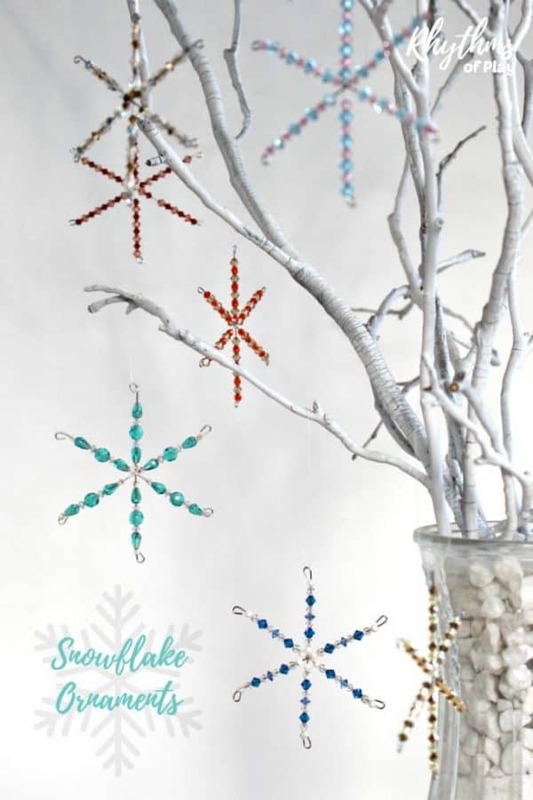 Choose a simple bead pattern for each wire bead snowflake ornament. Like real snowflakes, an infinite number of beaded patterns are possible for this snowflake craft. Place crystal beads on wire snowflake bead ornament craft form one arm at a time. Repeat until each arm of the wire bead snowflake ornament is complete. Use a section of ribbon or monofilament line to hang your homemade beaded snowflake ornaments. Watch our video to see how easy it is to make beaded snowflake ornaments. 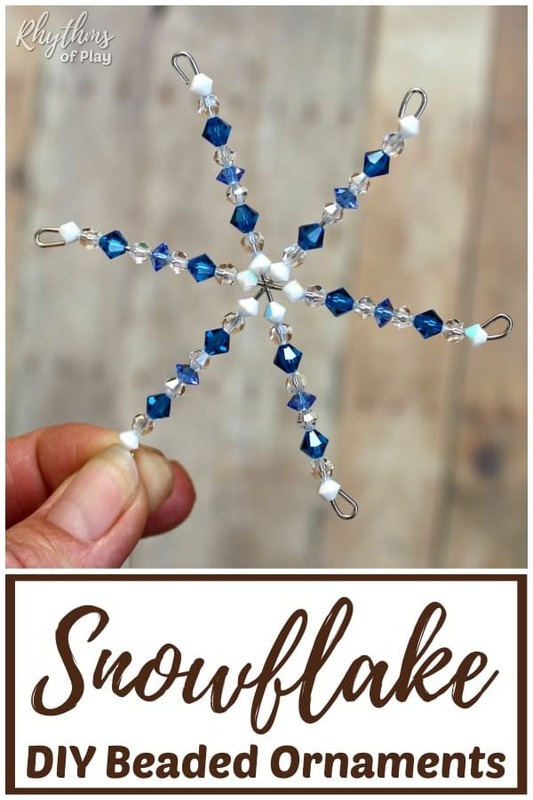 This wire bead ornament craft can help you make gorgeous snowflake craft Christmas decorations to adorn your Christmas tree! 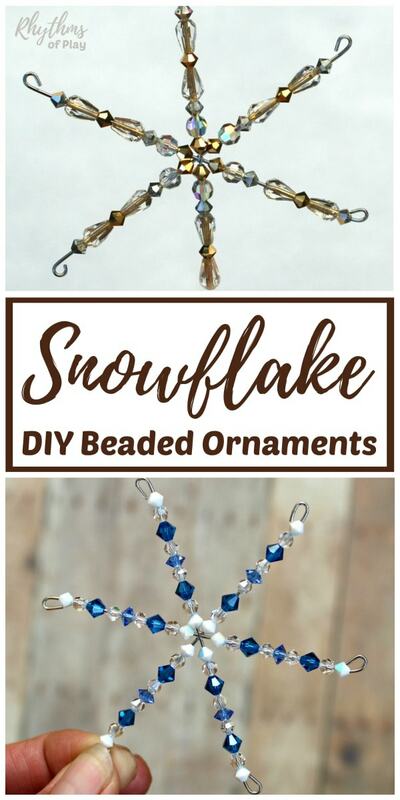 Use wire bead snowflake ornament forms, Swarovski crystals beads, and/or Faceted (cut) glass beads to make handmade beaded snowflake ornaments or use any of the beaded snowflake kits listed below. Make some sparkling snowflake ornament Christmas decorations to add a little bling to your Christmas tree this year. Making this beaded snowflake craft is a fun way to spend time connecting with the kids over the holiday break. You may also like this fun roundup of homemade Christmas ornament crafts and don’t forget to check out our winter bucket list and fun Christmas traditions for a magical holiday. Where did you get the beads? The supplies list is in the article above Michelle. Where do you get the star from to put the beads on? The materials list above contains referral links to the snowflake forms we used. What size beads did you use? That detail isn’t included in the supplies list. Very pretty and simple for a child to make! First, make sure kids can handle small parts before offering this craft. Using a combination of sizes, shapes, and colors make the best snowflakes. Younger kids can create patterns and put the beads on the wire, but will more than likely need each arm of the snowflake closed for them. Older children will be able to do both. The same goes for bead sizes, smaller 4mm beads will be hard for younger kids to handle while older children will be able to use the smallest beads. Click on the bead links in the supplies list above to see lots of gorgeous options! Excellent tutorials with photos and details! Even as an experienced beader, I picked up tips. Thank you!